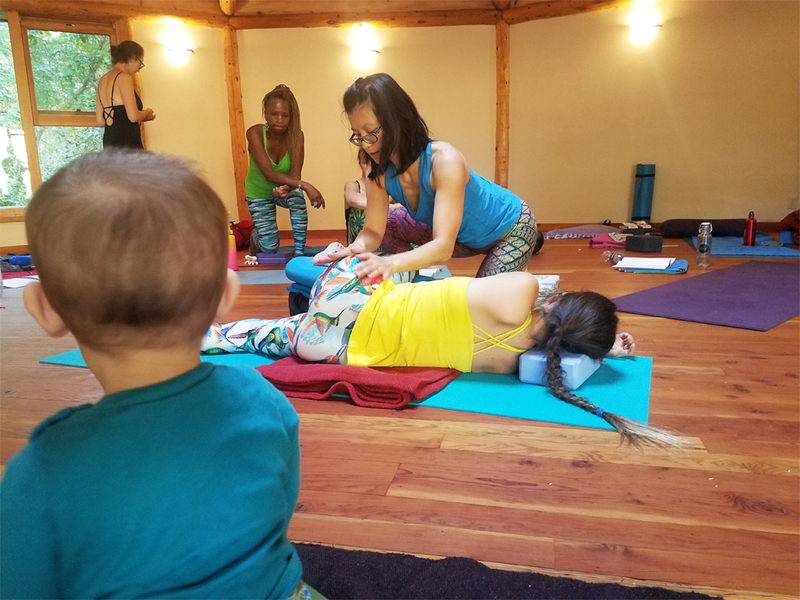 Poppy Perinatal Yoga, while not a style of yoga, is an approach that is founded on a set of principles that can be woven into any style of yoga. While brainstorming for a name, it was natural to gravitate toward names that alluded to motherhood and womanhood. However, not all birth-givers identify as a woman or mother. Hence, the name Poppy was chosen. Poppy is considered a gender-neutral and gender-inclusive term for parent. The goal isn’t to erase womanhood or motherhood or take that away from anyone, but it is to acknowledge and honor all identities, including non-binary persons. The manuals and curriculum in the Poppy trainings use gender-inclusive and gender-neutral language. 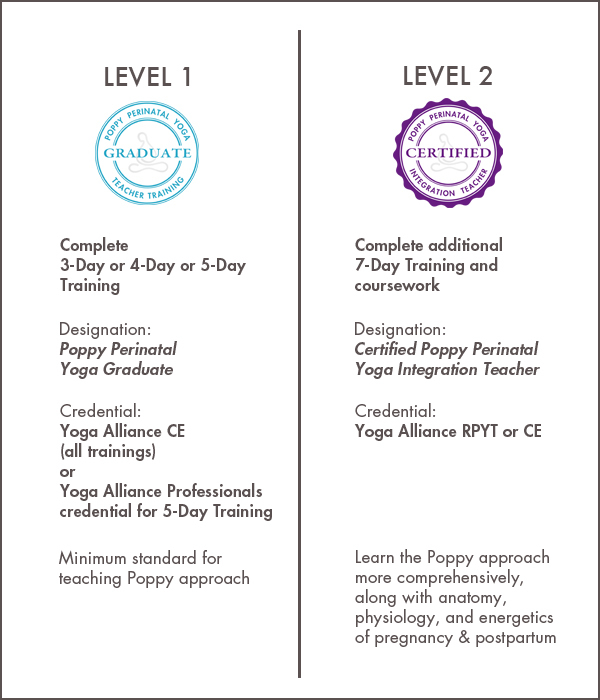 The principles of the Poppy Perinatal Yoga approach are B.A.S.S. The combination of these principles can foster more physical and emotional ease in pregnancy, labor, and postpartum recovery – no matter what birth plan or outcome. Breathe – Expand the entire ribcage thoroughly. Since many of us have chronically tight and constricted ribs, Poppy teaches specific exercises to tone and elasticize the ribs. A responsive ribcage makes more room for internal organs and baby during pregnancy and can also help prevent excess pressure from pushing down onto the pelvic floor. Excess pressure often leads to back pain, pelvic pain, and pelvic floor problems during pregnancy and post-birth. Align – Practice optimal alignment that is appropriate for each individual. We look at the relationship between feet, hips, and ribs and help each pregnant or postpartum person feel for the alignment that provides the framework to help soft tissues release excess tension and strengthen where there is excess slack. It is the framework for better internal balance and adaptability throughout the physical changes of pregnancy and postpartum. Support – The feet, legs, and core are our pillars of support. Feel the feet, legs, and core respond to your poses and movements. This is not to be confused with trying to get rock hard and sculpted 6-pack abs. Well-integrated legs and core steady you better through the spectacular physical, emotional, and spiritual changes that occur during pregnancy, labor, and post-birth. Soften – Labor, post-birth, and parenthood are challenging and intense. The more we harden against it, the more we stagnate. Practice softening so that you can respond to challenges with more intelligence and resourcefulness. The poppy approach advocates for softening during up-regulating and down-regulating practices. During up-regulation, expand a softening breath within the intensity of standing poses like Warrior 2 or Chair. During crucial down-regulation practices like meditation, myofascial releases, and relaxation poses, feel tension dissolve. These practices increase pelvic space for the baby to rotate and descend through. Soft tissue suppleness is an essential factor for cultivating the necessary core resiliency that supports postpartum core restoration. The integration of these 4 principles can help optimize internal conditions for better fetal positioning, reduced stress, improved digestion, increased comfort in pregnancy, more ease in labor and postpartum recovery, and a deeper bond between parent and baby. To teach the Poppy approach, you should first understand it. The best way to understand it is to participate in an experiential learning environment where you practice the yoga, interact with your peers, and receive live feedback. Once you feel this approach in your body, you can teach it more effectively to others. Complete Level 1 Training by attending a 3-day or 4-day or 5-day training. Upon successful completion, you are designated as a Graduate and can teach the Poppy approach. If you want to be promoted to Certified in teaching the Poppy approach, then you must complete Level 2 Training and additional coursework. Level 2 is a 6-day or 7-day training. You can complete Level 1 and Level 2 separately in a modular format, or you can do both within a 9-day training. If it is taught in a retreat setting, then the 9-day becomes a 10-day training retreat.